T cells require continual presence of extrinsic signals from their in vivo microenvironment to maintain viability. T cells removed from these signals and placed in tissue culture atrophied and died in a caspase-independent manner. Atrophy was characterized by smaller cell sizes, delayed mitogenic responses, and decreased glycolytic rate. Bcl-2 expression remained constant in vitro despite ongoing cell death, indicating that endogenous Bcl-2 expression is insufficient to explain the life span and size control of lymphocytes in vivo and that cell-extrinsic signals provided may be required to maintain both cell viability and size in vivo. One such signal, IL-7, was found to maintain both the size and survival of neglected T cells in vitro. IL-7 was not unique, because the common γ-chain cytokines IL-2, IL-4, and IL-15, as well as the gp130 cytokine IL-6, also promoted both T cell survival and size maintenance. IL-7 did not induce resting T cells to proliferate. Instead, IL-7 stimulated neglected T cells to maintain their metabolic rate at levels comparable to freshly isolated cells. The survival and trophic effects of IL-7 could be separated because IL-7 was able to promote up-regulation of Bcl-2 and maintain cell viability independent of phosphatidylinositol 3-kinase and mammalian target of rapamycin activity but was unable to prevent cellular atrophy when phosphatidylinositol 3-kinase and mammalian target of rapamycin were inhibited. These data demonstrate that T cells require the continuous presence of extrinsic signals not only to survive but also to maintain their size, metabolic activity, and the ability to respond rapidly to mitogenic signals. In metazoan organisms, cells require the continuous presence of extrinsic signals to maintain their viability both in vitro and in vivo. When such support is withdrawn, cells undergo apoptosis via a cell-intrinsic pathway (1). In contrast to extrinsic cell death pathways initiated by the direct activation of caspases by cell surface receptor complexes (2), the intrinsic pathway is initiated by mitochondria. Upon metabolic inhibition or removal from extrinsic signals, mitochondria release cytochrome c from the intermembrane space into the cytosol to activate a caspase cascade and provide apoptotic morphology to cell death. However, caspase activation is not required for death by the intrinsic pathway, because alterations in cellular physiology when extrinsic signals are removed can be sufficient to result in cell death in the absence of caspase activity (3, 4, 5, 6, 7). Prominent among these physiological responses is progressive cellular atrophy characterized by decreased cell size and delayed response to mitogenic signals (8). Some of these changes in cellular physiology in response to removal from extrinsic signals occur before commitment to cell death. For example, despite the ability of Bcl-2 or Bcl-xL to prevent loss of mitochondrial homeostasis and cell death when cells are cultured in the absence of stimulation, these proteins cannot prevent cellular atrophy. A possible mechanism by which extrinsic signals prevent decreases in cell size and function is through maintenance of cellular metabolism and balanced protein synthesis and degradation. When factor-dependent cell lines are removed from these signals, glycolytic rates and cellular ATP decrease (9, 10, 11), protein degradation is increased, and protein synthesis is inhibited.4 The reduced metabolic rates may be due to intracellular translocation and degradation of Glut1 (8),4 thus decreasing ability of cells to take up sufficient glucose to maintain downstream metabolism. Reduced energy stores may result in lower biosynthetic capacity, cell size, protein content, and the ability of cells to respond rapidly to mitogenic stimuli. In addition, increasing limitations on availability of glycolysis-derived metabolic intermediates, such as pyruvate, may ultimately contribute to the loss of mitochondrial homeostasis and initiate the intrinsic cell death pathway. The signaling mechanism by which growth factors prevent atrophy and promote cellular metabolism is uncertain, but phosphatidylinositol 3-kinase (PI(3)-K)3 and mammalian target of rapamycin (mTOR) have been shown to stimulate cellular metabolism and are activated by a variety of growth stimuli. PI(3)-K and its downstream signaling molecule Akt can promote glucose uptake and metabolism (12, 13, 14, 15) and mTOR is critical in promoting protein-efficient translation and inhibiting protein degradation (16). IL-7 is a cytokine that provides a survival-promoting extrinsic signal to both T cells and B cells and has been shown to be critical for lymphocyte homeostasis at multiple stages. Deficiency in IL-7 or IL-7Rα receptor blocks both T and B cell development (17, 18). IL-7 is also important in promoting the survival of resting and activated peripheral T cells (19, 20, 21, 22, 23) and homeostatic proliferation (24). The mechanism by which IL-7 performs these developmental and homeostatic regulations is uncertain, but the ability of IL-7 to promote expression of Bcl-2 and cell survival has been suggested to be a critical aspect of IL-7 activity. Transgenic expression of Bcl-2 can partially rescue T cell development in IL-7Rα-deficient mice, indicating that IL-7 was not required for T lineage commitment but rather promoted lymphocyte survival (25, 26). However, the failure of Bcl-2 overexpression to provide complete rescue from IL-7 deficiency in vivo demonstrated that the role of IL-7 is more complex than simply inhibiting apoptosis through up-regulation of the antiapoptotic Bcl-2 protein. The IL-7R consists of the common γ-chain (γc) and the IL-7Rα chain and activates multiple signal transduction pathways, notably the activation of Janus kinase (Jak)1 and Jak3 to phosphorylate the transcription factor Stat5 (27, 28, 29) and the activation of PI(3)-K and Akt (29, 30). The activation of Akt by the IL-7R (29) suggests that, in addition to induction of Bcl-2 expression, IL-7 may also regulate cellular metabolism. The effect of IL-7 on T cell metabolism and the role of that regulation on T cell survival and homeostasis are unknown. Because the role of cellular trophic state in maintaining T cell survival and function is uncertain, we determined the cell size and metabolic changes in T cells undergoing death by neglect and the effect of IL-7 on these changes. In untreated cells, expression of Bcl-2, Bcl-xL, and Bax remained unchanged during neglect, but T cells nevertheless atrophied and underwent programmed cell death. Thus, the in vivo level of Bcl-2 expression in resting T cells is unable to support T cell trophic state or survival to normal life span when removed from in vivo microenvironmental signals. Addition of IL-7 to tissue culture supernatants protected purified T lymphocytes from both death by neglect and cellular atrophy. This effect was not unique to IL-7, but also occurred with γc cytokines IL-2, IL-4, and IL-15 as well as the gp130 cytokine IL-6. While the survival effect of IL-7 lasted after removal of IL-7, the trophic effect required the continuous presence of IL-7. The trophic effect of IL-7 was not caused by forcing T cells to enter the cell cycle but rather was the result of preventing the decline in glycolytic and respiratory rates that occurs in neglected T cells. Analysis of IL-7 signaling demonstrated that while neither mTOR nor PI(3)-K was required to promote Bcl-2 induction and T cell survival, both contributed to the maintenance of cell size and glucose metabolism. Together these results demonstrate that T cells require extrinsic signals to maintain synthetic activity and glycolysis and IL-7 can maintain T cell trophic state in a PI(3)-K- and mTOR-dependent manner as well as promote T cell survival in the absence of inducing either proliferation or differentiation. Nontransgenic mice were C57BL/6J (The Jackson Laboratory; Bar Harbor, ME). Mice transgenic for T cell-specific expression of Bcl-xL carried the pLck-Bcl-xL transgene and were backcrossed onto the C57BL/6J background (31). All mice were analyzed between 8 and 16 wk of age. T cells were purified as described (8) from pooled spleen and mesenteric lymph node cell suspensions by negative selection using StemSep magnetic purification kits (StemCell Technologies, Vancouver, British Columbia, Canada), and purities were 95% or higher. Purified T cells were cultured in complete RPMI 1640 (Life Technologies, Grand Island, NY). Following purification, T cells were placed at 37°C for 30 min to 1 h to adjust to in vitro conditions before any assays were conducted. IL-2, IL-4, IL-6, IL-7 (BD PharMingen, San Diego, CA), and IL-15 (Research Diagnostics, Flanders, NJ) were added to tissue culture media in concentrations ranging from 0.001 to 100 ng/ml. IL-7 was used at 1 ng/ml in most experiments. The caspase inhibitor, benzoyloxycarbonyl-Val-Ala-Asp-fluoromethylketone (O-methyl) (zVAD-fmk; Enzyme System Products, Livermore, CA), was used at 20 μM; PI(3)-K inhibitor, LY294002 (Calbiochem, La Jolla, CA), was added in doses from 0.156 to 10 μM; and the mTOR inhibitor, rapamycin (Sigma-Aldrich, St. Louis, MO), was used in doses from 1.56 to 100 nM. T cells were incubated at 37°C with inhibitors for 4 h before addition of IL-7. In some cases, T cells were cultured on wells that had been coated with 10 μg/ml anti-CD3 (clone 145-2C11; BD PharMingen) and 2 μg/ml anti-CD28 (clone 37.51; BD PharMingen). Bromo-deoxyuridine (BrdU; Sigma-Aldrich) was added to these wells at 10 μM. At various time points after culture, T cells were harvested and analyzed flow cytometrically using a FACSCalibur (BD Biosciences, San Jose, CA). Samples for flow cytometric analysis for size and viability were maintained in RPMI 1640. Viability was determined flow cytometrically by staining cells with 10 μg/ml propidium iodide (Molecular Probes, Eugene, OR). Cell sizes were determined flow cytometrically by determining forward light scatter. To ensure reproducibility, the forward scatter readings were standardized in each experiment by adjusting the gain to normalize forward scatter readings for Flow Check Fluorospheres (Beckman Coulter, Miami, FL) as described (8). Cells were stained for BrdU incorporation as described (8). To determine Bcl-2, Bcl-xL, Bax, and actin expression, T cells were cultured without stimulation for 24 h, in IL-7 for 24 h, or were freshly isolated. Viable T cells were isolated by Lympholyte-M (CedarLane Laboratories, Hornby, Ontario, Canada) as described by the manufacturer. T cells were lysed in NET-N (20 mM Tris (pH 8), 100 mM NaCl, 1 mM EDTA, 0.5% Nonidet P-40) supplemented with protease inhibitors (BD PharMingen). Lysates equivalent to 106 T cells/sample were subjected to SDS-PAGE (Invitrogen, Carlsbad, CA) and blots were probed with polyclonal anti-Bcl-2 (BD PharMingen), polyclonal anti-Bax (BD PharMingen), actin (Santa Cruz Biotechnology, Santa Cruz, CA), polyclonal anti-Bcl-xL (BD PharMingen), anti-phospho-Akt (Ser473; Cell Signaling Technology, Beverly, MA), and phospho-S6 kinase (Thr421/Ser424; Cell Signaling Technology). Protein contents were determined by bicinchoninic acid assay (Pierce, Rockford, IL). T cell oxygen consumption was determined by culturing 107 viable T cells at 37°C in an oxymeter as described (10). This experiment was conducted three separate times and data presented represent means and SDs of these results. Glycolysis was determined by measuring the dehydration of 2-phosphoglycerate to phosphoenolpyruvate by enolase as described (11, 32). Briefly, 2 × 106 viable T cells were washed in PBS and incubated in glucose-free Kreb’s buffer (115 mM NaCl, 2 mM KCl, 25 mM NaHCO3, 1 mM MgCl2, 2 mM CaCl2, 0.25% BSA, pH 7.4) in a 5% CO2 incubator at 37°C. After 30 min, 10 μCi of d-[5-3H](N)-glucose (C5-[3H]glucose; NEN, Boston, MA) was added to the cultures and total glucose was brought to 10 mM by the addition of nonradiolabeled d-glucose. Cells were cultured at 37°C for 1 h. The reaction was stopped by the addition of an equal volume of 0.2 N HCl. [3H]H2O was separated from unmetabolized [3H]glucose by evaporative diffusion in a closed chamber. When T cells are removed from their normal microenvironment, T cells atrophy and undergo programmed cell death (8). To study how extrinsic signals from the T cell microenvironment regulate T cell physiology and survival, T cells were purified from spleen and lymph node and cultured in vitro. At various time points after the start of in vitro culture, T cells were harvested and viability and cell size were determined flow cytometrically by propidium iodide exclusion and mean forward angle light scatter, respectively. T cells were found to decrease in size and die over time (Fig. 1⇓A). This represented true decreases in cell size over time rather than selective loss of large cells because, despite their initially smaller size (8), T cells expressing a Bcl-xL transgene decreased in size over time without significant cell death. Therefore, atrophy does not require commitment to cell death and these two processes can be separated. Neither cell death nor atrophy was caspase dependent because addition of the caspase inhibitor, zVAD-fmk, to cultures during T cell neglect had only minor effects on survival and no effect on cellular trophic state. (Fig. 1⇓B). To test whether cell death during neglect occurred due to loss of Bcl-2 expression over time as had been previously reported (19, 21), lysates of T cells that were either freshly isolated or cultured for 24 h in vitro in the absence of receptor stimulation were analyzed for Bcl-2 expression. Neglect for 24 h was selected because it was a time point where ∼50% of T cells had died. To ensure that protein degradation in apoptotic cells did not obscure changes in protein expression involved in the commitment to apoptosis, only viable T cells were analyzed. Protein levels of Bcl-2, Bax, and actin were found to remain unchanged in viable neglected T cells (Fig. 1⇓C). Bcl-xL was found at very low levels, but long exposures showed that it too remained unchanged during neglect (data not shown). Therefore, neglect does not cause an obligatory down-regulation of Bcl-2. Primary cells atrophy and die in vitro in a caspase-independent manner despite maintenance of Bcl-2 expression. A, T cells were purified from nontransgenic or Bcl-xL transgenic mice and were placed in suspension culture. At various time points after the start of culture T cells were harvested and analyzed for size and viability flow cytometrically by forward angle light scatter and propidium iodide exclusion. The forward light scatter profiles of viable cells are shown at various times after the start of culture. B, Purified T cells were cultured in the presence of the caspase inhibitor, zVAD-fmk (zVAD), to determine the role of caspase activity in cell atrophy and death during neglect. Viability and cell size (as determined by mean forward angle light scatter) were determined as described above in triplicate and means and SDs are shown. C, Expression of Bcl-2 and Bax were determined by Western blot of cell lysates of viable cells isolated by Ficoll either freshly purified from murine spleen and lymph nodes or after a 1-day in vitro culture. Actin was probed as a loading control. Because IL-7 has been shown to maintain cell survival (19, 20, 21, 22), we next sought to determine the effect of IL-7 on T cell trophic state during neglect. Purified T cells in the absence of IL-7 were 20.4 ± 1.5% viable at 50 h and 4.4 ± 0.1% viable at 96 h in culture. However, T cells cultured in the presence of 1 ng/ml rIL-7 demonstrated a 74.7 ± 0.3% survival at 96 h (Fig. 2⇓A). Titration of IL-7 showed that doses as low as 0.1 ng/ml were sufficient to measurably prevent T cell death after 40 h in culture, with a saturating effect at 1 ng/ml (Fig. 2⇓B). To determine what effect IL-7 had on T cell trophic state, T cell size was determined flow cytometrically by measuring mean forward light scatter. IL-7 at 1 ng/ml was found to almost completely prevent the reduction in cell size that is characteristic of cellular atrophy during neglect (Fig. 2⇓C). The trophic effect of IL-7 on T cells in culture for 40 h titrated similarly to the survival effect of IL-7, with detectable effects at 0.1 ng/ml IL-7 and saturation at 1 ng/ml IL-7 (Fig. 2⇓D). To confirm that changes in mean forward light scatter measurements determined flow cytometrically were representative of true changes in cell volume, T cells that had been freshly isolated or had been in culture for 24 h in the absence or presence of 1 ng/ml IL-7 were Ficolled (Amersham Pharmacia Biotech, Piscataway, NJ) to remove dead cells, and the size of viable cells was determined by particle size analyzer (Coulter Z2; Beckman Coulter). Freshly isolated T cells were found to have a mean volume of 131.4 ± 3.9 fL while T cells cultured in the absence of IL-7 were 123 ± 1.9 fL. IL-7 maintained T cell size as treated T cell averaged 132.8 ± 1.1 fL in volume (Fig. 2⇓E). IL-7 prevents both cell death and atrophy. A, Viability of purified T cells cultured alone or with 1 ng/ml IL-7 added to the culture medium was determined flow cytometrically by propidium iodide exclusion at multiple time points after the start of culture. B, After a 40-h in vitro culture in various doses of IL-7, T cell viability was determined as described. C, The size of viable T cells was determined flow cytometrically by mean forward light scatter at multiple time points after the start of culture either alone or in the presence of 1 ng/ml IL-7. D, After a 40-h in vitro culture in various doses of IL-7, T cell size was determined as described. Means and SDs of triplicate samples are shown in A–D. E, T cells that had been freshly isolated or cultured for 24 h in the absence or presence of 1 ng/ml IL-7 were Ficolled to remove dead cells, and cell sizes were determined with a particle size analyzer (Coulter Z2). Means and SDs of cell sizes measured in six separate experiments are shown. Statistical significances were determined by a two-tailed Student’s t test. In addition to IL-7, other members of the γc family of cytokines, including IL-2, IL-4, and IL-15, and the gp130 cytokine family member, IL-6, have all been shown to promote T cell survival in vitro (19, 20, 21, 22, 33, 34). To determine whether the ability of IL-7 to promote cell size maintenance was unique to IL-7, we tested the effect of other cytokines on T cell size and survival in vitro. Purified T cells were cultured in the absence of cytokine or with IL-2, IL-4, IL-7, IL-15, or IL-6 at doses from 0.001 to 100 ng/ml, and after 44 h in culture, cell viability and size were determined. All cytokines tested provided a survival advantage (Fig. 3⇓A), with IL-4 and IL-7 supporting the highest viabilities at the lowest doses. Consistent with the low affinity of the shared IL-2βR subunit of the IL-2 and IL-15 receptors, IL-2 and IL-15 provided significant protection from death, but only at high cytokine concentrations. IL-6 protected from death at low doses but to a lesser extent than the γc cytokines. All cytokines tested also were found to affect resting T cell size (Fig. 3⇓B). IL-7 and IL-4 provided trophic effects at the lowest cytokine doses while IL-2 and IL-15 provided significant trophic support only at high cytokine doses. IL-6 also had a significant effect on T cell size, but this effect was smaller than that of the γc cytokines. Therefore, a correlation was found to exist between the ability of cytokines to promote cell survival and their ability to promote the maintenance of cell size. Furthermore, these data indicate that the ability of cytokines to promote cell size maintenance is not unique to IL-7 but includes γc cytokines and the gp130 cytokine, IL-6. γc cytokines and the gp130 cytokine, IL-6, promote both cell survival and the maintenance of cell size. Purified T cells were cultured for 44 h alone or in the presence of IL-2, IL-4, IL-6, IL-7, or IL-15 at concentrations from 0.001 to 100 ng/ml and analyzed flow cytometrically. A, T cell viabilities were determined by propidium iodide exclusion. B, T cell sizes were determined by measurement of mean forward light scatter of resting T cells. Means and SDs are shown from triplicate samples. One possible explanation for the ability of IL-7 to prevent atrophy was that some or all cells were induced to proliferate. This may increase the mean cell size and may offset any decreased cell size induced by atrophy. However, the failure to detect an increased frequency of enlarged cells when treated with IL-7 (data not shown) suggested that T cell blast formation was not occurring. To confirm this, we tested whether any cell division took place in the presence of IL-7. At doses from 0.1 to 100 ng/ml, IL-7 was unable to induce CFSE-stained T cells to divide after 48 h in vitro (data not shown). To test whether IL-7 was sufficient to induce T cells to replicate DNA, purified T cells were cultured with BrdU in the medium with 1, 10, or 100 ng/ml IL-7 or on wells coated with anti-CD3 and anti-CD28. After 40 h in culture, cells were harvested and incorporation of BrdU was determined flow cytometrically to identify cells that had entered S phase of the cell cycle (Fig. 4⇓). In contrast to CD3/CD28 stimulation, IL-7 was insufficient to cause resting T cells to synthesize DNA and incorporate BrdU at all doses tested. IL-7 does not induce naive T cells to proliferate. Purified T cells were cultured on tissue culture plates that had been coated with 10 μg/ml anti-CD3 and 2 μg/ml anti-CD28 or with various doses of IL-7 added to the supernatant. BrdU was added to each sample at the start of cell culture. After 36 h, cells were harvested and incorporation of BrdU was measured flow cytometrically. Means and SDs of triplicate samples are shown. To analyze the nature of the survival and trophic effects of IL-7 on T cells, the stability of these phenotypes was determined upon removal from IL-7. T cells were cultured in IL-7 for 24 h, Ficolled to isolate live cells, washed to remove IL-7, and re-cultured in the absence of IL-7 or with IL-7 added back. These T cells were then compared with freshly purified T cells that were also Ficolled and cultured in the absence or presence of IL-7. Cultures with IL-7 maintained high viabilities for the duration of the experiment. 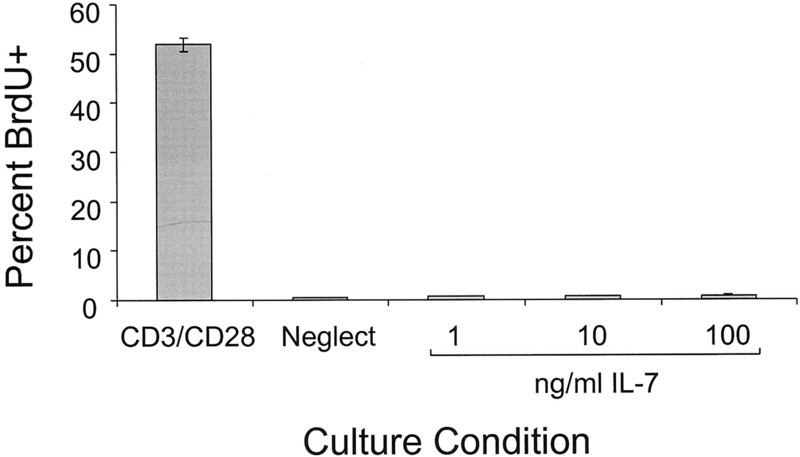 Freshly isolated T cells cultured in the absence of IL-7 died over time (Fig. 5⇓A), while T cells that had been precultured 24 h in the presence of IL-7 but removed from IL-7 for secondary culture were able to survive at high percentages up to 40 h. After 40 h, these cells began to die at a rate similar to freshly isolated and neglected cells. In contrast to enhanced cell survival even after removal from IL-7, pretreatment with IL-7 had no effect on cell size. 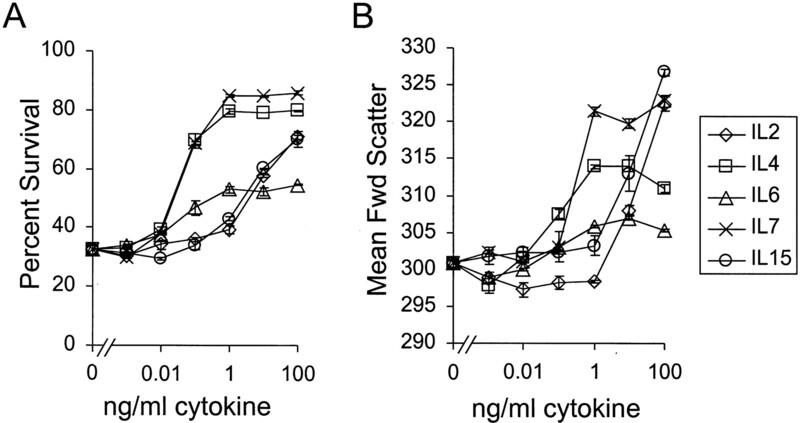 T cells pretreated with IL-7 but washed free of the cytokine atrophied at a rate similar to that of freshly isolated and neglected T cells (Fig. 5⇓B). IL-7 enhances survival even after cytokine removal, but the effect of IL-7 on cell size requires continuous cytokine. A, Viable T cells were isolated by Ficoll from purified T cell cultures that had been treated with 1 ng/ml IL-7 for 1 day or freshly isolated. Cell viability was then determined flow cytometrically by propidium iodide exclusion to determine how long-lasting the survival effect of IL-7 was on cells removed from IL-7 compared with cells replenished with IL-7 or freshly isolated T cells never treated with IL-7 or cultured in IL-7. B, T cell sizes were determined as described above. Means and SDs of triplicate samples are shown. In addition to decreased cell size, a characteristic feature of cellular atrophy is delayed response to mitogenic stimuli. This delay may be caused by the additional growth requirements of atrophic cells that must take place before cell division can occur. To test whether IL-7 was sufficient to restore a normal response to neglected T cells, T cells were neglected or cultured in IL-7 for 24 h. Fresh T cells were purified and all groups were Ficolled to isolate live cells. Viable T cells were washed to remove all IL-7 and cells were recultured on tissue culture plates that had been coated with anti-CD3 and anti-CD28. 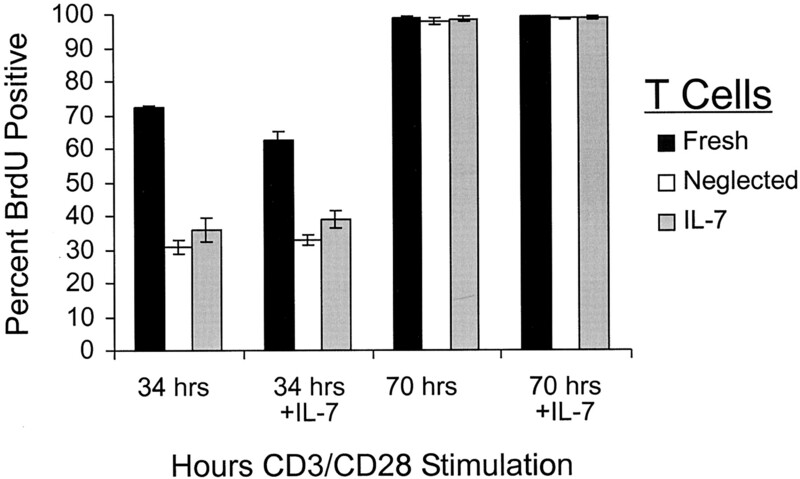 IL-7 was added back to the media of some cultures at 1 ng/ml to measure the effect of the presence of IL-7 on stimulation by anti-CD3 and anti-CD28. To determine entry to cell cycle, BrdU was added to the culture medium and BrdU incorporation was determined flow cytometrically (Fig. 6⇓). After 34 h of stimulation, 72.3 ± 0.5% of cells that had been freshly isolated at the start of the second culture had incorporated BrdU. T cells that had been neglected in the first culture were delayed in their response to anti-CD3 and anti-CD28 and only 30.7 ± 1.9% had incorporated BrdU in the second culture by 34 h. IL-7 pretreatment was unable to fully rescue this delayed mitogenic response, as 35.9 ± 3.5% of IL-7-pretreated T cells had incorporated BrdU after 34 h in culture on anti-CD3- and anti-CD28-coated plates. Maintaining IL-7 in the culture supernatant during activation did not enhance T cell entry to cell cycle. Instead, IL-7 appeared to diminish the ability of freshly isolated naive T cells to divide. The failure of neglected or IL-7-pretreated T cells to respond as rapidly as freshly isolated T cells to stimulation by anti-CD3 and anti-CD28 was not due to an inability of these cells to proliferate, because >97% of cells had incorporated BrdU after 70 h of stimulation regardless of the initial state of the T cells. Neglect causes a delayed mitogenic response that IL-7 cannot fully overcome. Purified T cells were Ficolled to isolate viable cells that either were freshly isolated or had been cultured alone or in the presence of 1 ng/ml IL-7 for 24 h. Cells were then cultured on anti-CD3- and anti-CD28-coated plates in the presence of BrdU with or without the addition of 1 ng/ml IL-7 to the supernatant. Cells were harvested at 34 and 70 h and incorporation of BrdU was determined flow cytometrically. Means and SDs of six replicates are shown for each condition. The glycolytic rates of atrophic factor-dependent cell lines have been shown to decrease upon removal from growth factor (11). Therefore, we sought to measure glucose metabolism during T cell neglect and determine how IL-7 may affect that metabolism. To test whether primary T cells decrease metabolic rates in response to removal from growth factor, we measured oxygen consumption and glucose use by freshly isolated T cells, T cells that had been neglected for 24 h, and T cells that had been cultured with IL-7 for 24 h. In vitro culture did not significantly affect oxygen consumption, as fresh, neglected, and IL-7-pretreated T cells used 11.2 ± 1.0, 8.9 ± 2.1, and 11.0 ± 1.2 mtorr of oxygen/107 cells/s, respectively, when measured in an oxymeter at 37°C. However, rates of glycolysis were significantly affected by in vitro culture (Fig. 7⇓). Rates of glucose metabolism were determined by culturing cells in C5-[3H]glucose. The production of [3H]water in the dehydration of 2-phosphoglycerate to phosphoenolpyruvate by enolase was measured to calculate the rate of glucose consumption. Thus, this measurement incorporates both rates of glucose uptake and rates of glycolysis. Similar to cell lines withdrawn from growth factor, viable T cells that were neglected for 24 h before measurement metabolized glucose at approximately half the rate of viable freshly isolated cells (1.61 ± 0.26 compared with 3.09 ± 0.47 nmole glucose/106 T cells/h). However, the addition of IL-7 to the initial T cell culture was found to be sufficient to maintain glucose metabolism to approximately normal levels (3.43 ± 0.53 nmole glucose/106 T cells/h). Neglect results in a decreased glycolytic rate that IL-7 can prevent. The rates of glycolysis are shown for T cells that were freshly isolated or had been cultured 1 day alone or in the presence of 1 ng/ml IL-7. Means and SDs of nine replicates are shown for each condition. To dissect signaling pathways required by IL-7 to regulate survival and cellular metabolism, purified T cells were cultured with the PI(3)-K inhibitor, LY294002, and the mTOR inhibitor, rapamycin, and the effect on cell size and survival of the addition of IL-7 to the culture supernatant was measured. The inhibitors were functional, because they blocked the generation of phosphorylated targets of PI(3)K and mTOR, phospho-Akt and phospho-S6 kinase, respectively, when T cells were treated with γc cytokines (data not shown). T cells were cultured for 4 h in the absence of inhibitors or with various doses of a PI(3)-K inhibitor, LY294002, or the mTOR inhibitor, rapamycin, either alone or in combination. IL-7 was then added to each well and cell viability and size were determined flow cytometrically 24 h later. The survival of T cells in the absence of IL-7 was decreased slightly by LY294002 and rapamycin (Fig. 8⇓A). Nevertheless, the addition of IL-7 was sufficient to provide significant protection from death in the presence of each inhibitor alone or in combination. To determine the mechanisms of protection from death by IL-7, cell lysates were made and expression of Bcl-2, Bcl-xL, Bax, and actin were determined (Fig. 8⇓B and data not shown). There was no difference in expression of Bcl-2, Bcl-xL, or Bax between freshly isolated cells and viable T cells that had been neglected 24 h and recovered by Ficoll. However, treatment with IL-7 increased Bcl-2 expression in viable T cells in a PI(3)-K/mTOR-independent manner. IL-7 had no effect on Bcl-xL or Bax expression (data not shown). IL-7 can promote cell survival by PI(3)-K- and mTOR-independent up-regulation of Bcl-2. A, Viability was determined flow cytometrically by propidium iodide exclusion of purified T cells cultured alone or in IL-7 without inhibitors or with 10 μM LY294002 (LY) or 100 nM rapamycin (Rap) added 4 h before IL-7 addition. Means and SDs of triplicate samples are shown. 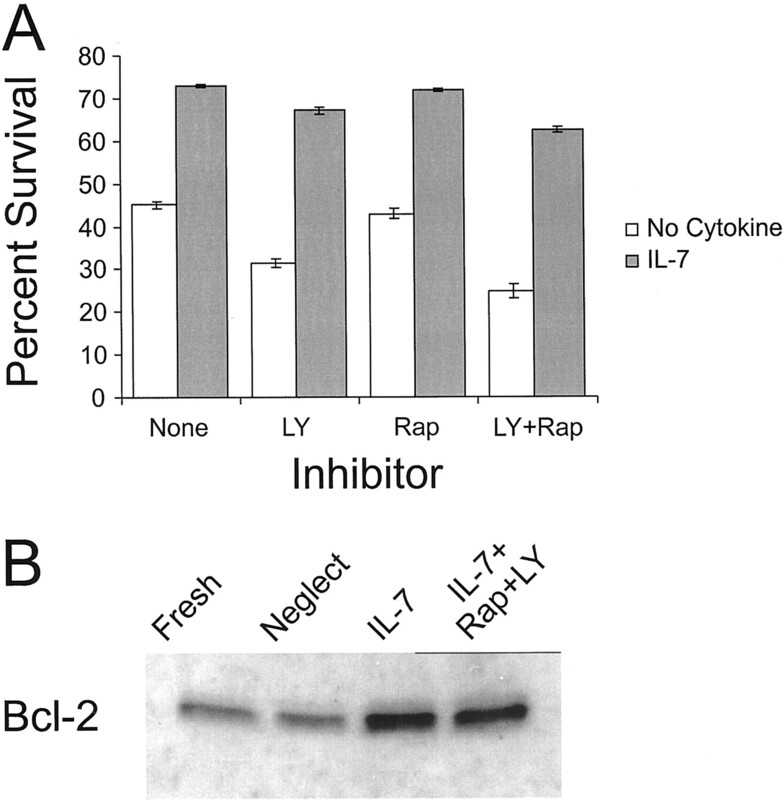 B, Lysates were made from T cells that had been freshly isolated, neglected, treated with IL-7, or treated with IL-7 in the presence of 10 μM LY294002 and 100 nM rapamycin. Expression of Bcl-2 was determined by Western blot. In contrast to the lack of role for PI(3)-K and mTOR on the induction of Bcl-2 and the survival effect of IL-7, both PI(3)-K and mTOR contributed to the trophic effect of IL-7. Both LY294002 and rapamycin were able to partially inhibit the ability of IL-7 to prevent atrophy and maintain cell sizes comparable to freshly isolated T cells (Fig. 9⇓A and data not shown). However, together there was an additive effect as LY294002 and rapamycin combined to significantly inhibit the trophic effect of IL-7 so that in the presence of both inhibitors IL-7 had only a small effect on T cell size. The inability of IL-7 to prevent atrophy in the presence of LY294002 and rapamycin was also evidenced by decreased protein content per cell despite the presence of IL-7 when LY294002 and rapamycin were added to the cultures (Fig. 9⇓B). 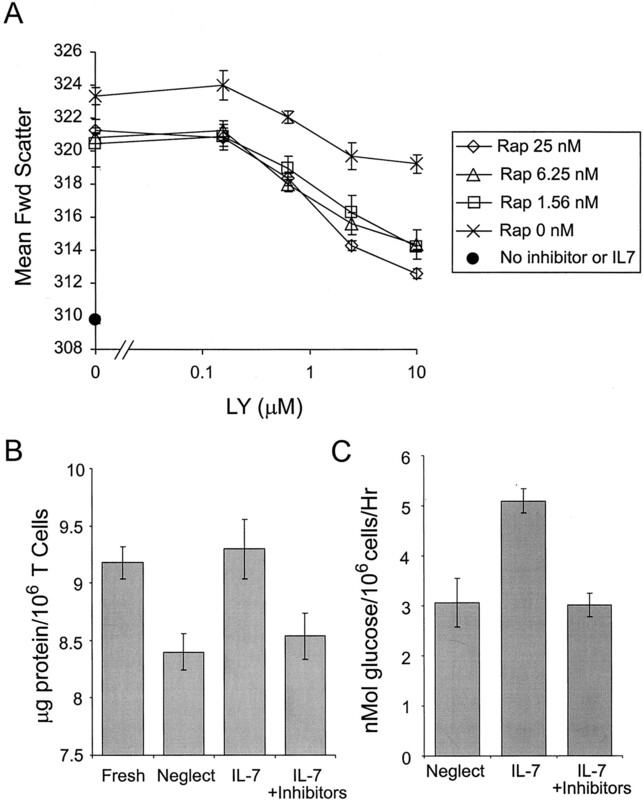 LY294002 and rapamycin also blocked the ability of IL-7 to maintain glucose metabolism at normal levels when T cells were neglected or pretreated with IL-7 alone or after a 4-h incubation with LY294002 and rapamycin (Fig. 9⇓C). PI(3)-K and mTOR function are required for the trophic effect of IL-7. A, Purified T cells were placed in culture alone or with the PI(3)-K inhibitor, LY294002 (LY), at 0–10 μM. or the mTOR inhibitor, rapamycin (Rap), at 0–25 nM for 4 h. IL-7 was then added at 1 ng/ml. Cells were harvested 24 h later and cell sizes were determined flow cytometrically by observing mean forward light scatter. B, Protein contents were determined from Ficoll-isolated viable freshly purified T cells or T cells that had been neglected or treated with IL-7 alone or in the presence of both 10 μM LY294002 and 100 nM rapamycin, as described above. C, Glycolytic rates of neglected T cells or T cells treated with IL-7 alone or in the presence of 10 μM LY294002 and 100 nM rapamycin were determined. Means and SDs of triplicate (A and B) or nine replicates (C) are shown. In this work we report that neglect and atrophy significantly affect T cell physiology and function and that the cytokine IL-7 can reverse these effects. Neglected T cells maintained Bcl-2 levels equivalent to freshly isolated T cells; nevertheless, the cells atrophied and underwent programmed cell death in a caspase-independent manner. Neglected T cells had decreased glycolytic rates and diminished ability to respond rapidly to mitogenic stimulus. In addition to its well-described ability to promote T cell survival, IL-7 also maintained cellular trophic state and glucose metabolism. The γc cytokines IL-2, IL-4, and IL-15 were also able to promote both T cell survival and size maintenance. In addition, IL-6 could partially prevent the size atrophy and death of neglected T cells, suggesting the signaling pathways of many cytokines intersect in the ability to stimulate size maintenance and prevent mitochondrially initiated apoptosis. The survival and trophic effects of IL-7 were separable because, although the survival effect continued for up to 40 h after removal from IL-7, prevention of atrophy required continuous IL-7. 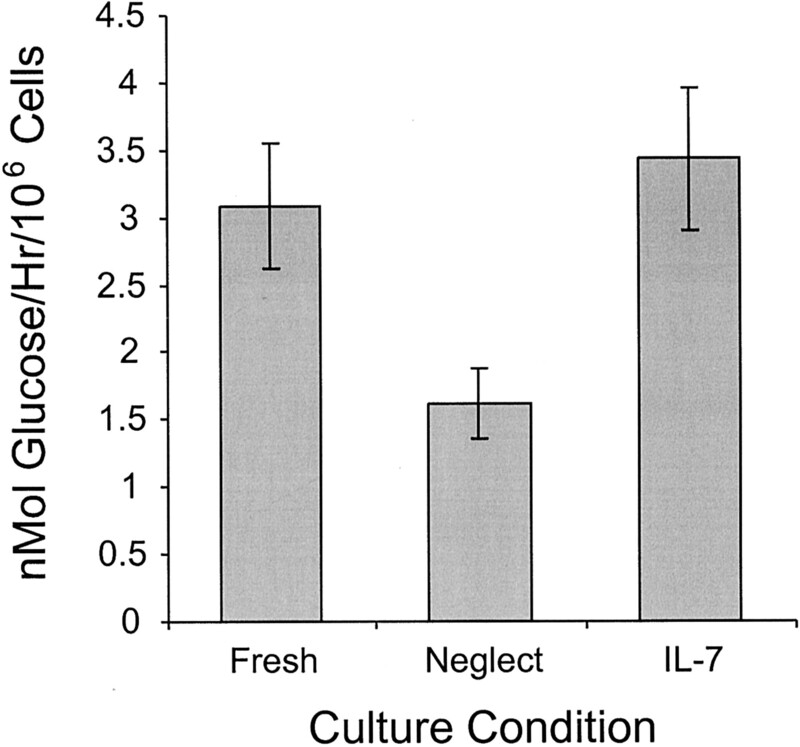 In contrast with relationship between trophic state and mitogenic response in cell lines (8), the trophic effect of IL-7 was insufficient to fully restore the ability of cultured T cells to respond rapidly to mitogenic stimuli. Although PI(3)-K and mTOR activity were not required for IL-7 to promote Bcl-2 induction and T cell survival in vitro, IL-7R signaling did require PI(3)-K and mTOR function to prevent atrophy and loss of glucose metabolism. In this study we found that T cells cultured in the absence of stimulation maintained constant Bcl-2 expression levels despite ongoing cell death. This is in contrast to previous findings where Bcl-2 expression was described to decrease during neglect (19, 21) and was thought to contribute to cell death. A key difference between this study and previous studies is the inclusion of dead T cells in the analysis of Bcl-2 levels in previous experiments. Because Bcl-2 can be cleaved by caspases in the process of apoptosis (35), we sought to remove effects of the apoptosis and cell death on Bcl-2 protein levels and examine only the effects of neglect on T cell Bcl-2 expression. Therefore, dead cells were removed by Ficoll in the experiments described in this work to examine only viable cells. 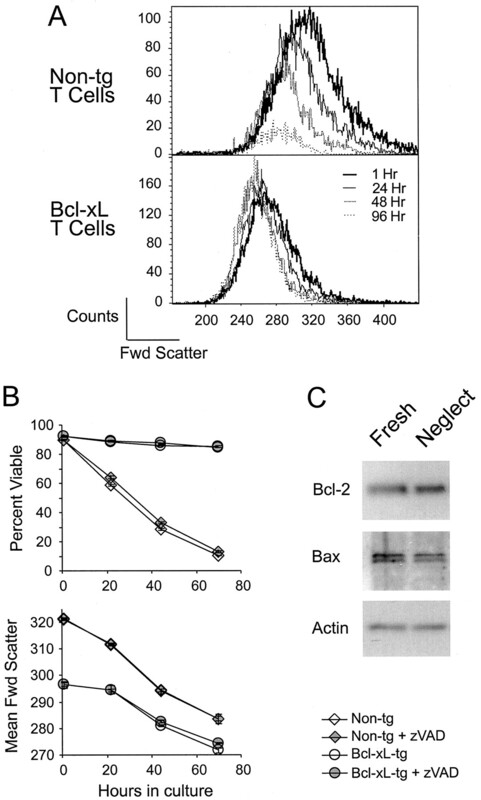 Although these data cannot exclude the possibility that Bcl-2 loss is rapid and occurs only in cells immediately before their death by neglect, the stability of Bcl-2 in T cells after a 24-h in vitro culture indicates that Bcl-2 expression levels do not decrease automatically during neglect. Therefore, the loss of Bcl-2 protein does not appear to be a primary event during T cell neglect, and endogenous Bcl-2 levels, on their own, are insufficient to maintain cell viability in the absence of extrinsic signals. The metabolism of resting T cells is a mixture of oxidative phosphorylation and glycolysis. Upon activation by mitogens, T cells greatly increase their use of glucose and rates of glycolysis (36). Oxidative phosphorylation may also increase, but the role of oxidative phosphorylation does not increase in proportion to the increase in glycolytic rate (36). Therefore, a net change from a mixed metabolism to a primarily glucose-dependent anaerobic metabolism occurs upon T cell activation. In an environment where glucose is normally not limiting and waste removal is efficient, such as in blood or lymph, this type of metabolism will provide sufficient biosynthetic substrates to grow while simultaneously generating the ATP required for growth. In contrast to T cell activation, T cell neglect results in a decrease in glycolysis while oxidative phosphorylation is maintained at or near the level of freshly isolated cells. This results in a relative increase in dependence on oxidative phosphorylation and represents a switch from ∼2–3 nmole oxygen/nmole glucose consumed in freshly isolated T cells compared with ∼4–6 nmole oxygen/nmole glucose consumed in neglected T cells. If glucose were the sole carbon source this would indicate nearly complete oxidation of glucose to carbon dioxide and water in neglected T cells. Complete dependence on oxidative metabolism, similar to that observed in neglected T cells, could generate considerable ATP, but total oxidation of glucose to CO2 would fail to provide biosynthetic substrates for cell growth. This would result in an inability to undertake sufficient macromolecular synthesis to maintain cell size and responsiveness. Neglected T cells had significant delays in their ability to respond to mitogenic signals through CD3 and CD28. A similar delay in response was observed in atrophic Bcl-xL transgenic T cells stimulated by CD3 and CD28 (8). This delay did not represent an inability to divide, because in each case the atrophic cells were competent to divide when given sufficient time. Together these data suggest that because atrophic cells have less mass and fewer biosynthetic substrates caused by the reduction in glycolysis, the cells may require more time to generate biosynthetic intermediates and to grow before entry to cell cycle. However, the ability of IL-7 to maintain cell size and glycolysis was insufficient to fully maintain the ability of mature T cells to respond rapidly to mitogenic stimulation. While regulation of cellular trophic state may play an important role in determining the ability of cells to enter cell cycle, neglect may also directly affect the cell cycle. Neglect could cause an inability to activate cell cycle machinery through loss or inhibition of cell cycle progression molecules or activation of cell cycle inhibitory proteins. A failure of IL-7 to affect such processes during neglect could explain the findings in this study. Alternatively, IL-7 may activate pathways that inhibit cell cycle progression. Indeed, treatment of freshly isolated T cells with IL-7 inhibited their ability to rapidly enter the cell cycle when stimulated through CD3 and CD28. Although many points in cell cycle regulation exist that IL-7 could regulate to inhibit cell cycle entry, one possible source of such inhibition is the induction of Bcl-2 itself. Expression of Bcl-2 has been proposed to affect translocation of NFAT and block T cell activation (37, 38). These possibilities are not mutually exclusive and IL-7 may fail to maintain rapid mitogenic responses both by not maintaining the expression of genes necessary for cell cycle entry and by directly inhibiting cell cycle progression. The ability to separate the survival and trophic effects of IL-7 suggests that distinct signal transduction pathways were responsible for maintenance of glucose metabolism and for induction of Bcl-2. Upon ligation with IL-7, the IL-7R complex activates Jak1 and Jak3, leading to the phosphorylation and translocation of Stat5, as well as activation of PI(3)-K (29). mTOR has not previously been identified as an independent component of IL-7R signal transduction but is activated by a wide variety of signaling pathways and is critical in regulating cell growth and protein turnover (16). In this work we show that the combined blockade of PI(3)-K and mTOR activity with LY294002 and rapamycin, respectively, strongly inhibited the trophic effect of IL-7. The additive effect of LY294002 and rapamycin suggests that mTOR was not directly downstream of PI(3)-K in a direct linear pathway, but rather the two signaling molecules acted in complementary pathways to promote the maintenance of cellular trophic state. Because blockade of PI(3)-K and mTOR activity had no effect on the up-regulation of Bcl-2, it is likely that Bcl-2 expression is controlled by the Jak/Stat pathway, as has been suggested for Jak3 (39). The promotion of cell survival by IL-7 may be accomplished through either maintenance of cellular metabolism, regulation of Bcl-2 expression, or a combination of these two approaches. Because glucose metabolism is required for factor-mediated survival (8, 40) and IL-7 promotes glucose metabolism (Figs. 7⇑ and 9⇑), the trophic effect of IL-7 could contribute to cell viability. However, the ability of IL-7 to promote cell survival was unchanged when the trophic effect of IL-7 was blocked with PI(3)-K and mTOR inhibitors, indicating that up-regulation of Bcl-2 alone was sufficient for survival. This increased Bcl-2 expression may allow T cell survival in the face of reduced cellular metabolism and limiting glucose-derived metabolic substrates by promoting continued mitochondrial homeostasis, as has been shown for Bcl-xL (8, 10, 11). The data presented in this work cannot distinguish the relative role of glucose metabolism vs Bcl-2 expression on maintaining T cell survival. Because trophic effects may be rapid but require continuous cytokine and Bcl-2, up-regulation would require time but could promote survival even after removal of cytokine; however, the ability of cytokines to promote each of these pathways may play distinct roles in T cell growth or survival at different stages of T cell maturation and activation. Therefore, the IL-7 receptor appears to independently engage signal transduction pathways that can regulate lymphocyte survival and size. The ability of other γc cytokines and the gp130 cytokine IL-6 to promote both lymphocyte survival and size indicates that this is may be a shared characteristic of receptors expressed on nonproliferating cells and suggests that it will be important in future work to further elucidate the common pathways of T cell size and metabolic regulation. We acknowledge the Thompson laboratory for advice and assistance in this work, with particular thanks to Kenneth A. Frauwirth and David R. Plas. ↵1 J.C.R. was supported by a fellowship from the Irvington Institute for Immunological Research. ↵3 Abbreviations used in this paper: PI(3)-K, phosphatidylinositol 3-kinase; BrdU, bromo-deoxyuridine; γC, common γ-chain; zVAD-fmk, benzoyloxycarbonyl-Val-Ala-Asp-fluoromethylketone (O-methyl); Jak, Janus kinase; mTOR, mammalian target of rapamycin. ↵4 A. Edinger and C. B. Thompson. Growth factors regulate cellular survival by controlling cellular access to nutrients. Submitted for publication.